Dan Airey tells us the story behind the Kiwi adventure game, Reverie. You'd be forgiven for not knowing about a little indie title called Reverie. Releasing to the beloved (but often overlooked) PlayStation Vita and later on PS4, this little gem came from a New Zealand studio of just three developers. 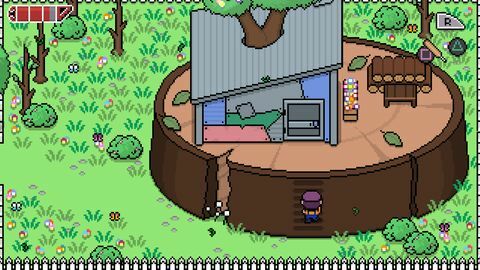 Not only is it a gorgeous callback to classic adventure games like Zelda and (not so classic) Earthbound, Reverie is also jam-packed full of Kiwiana. 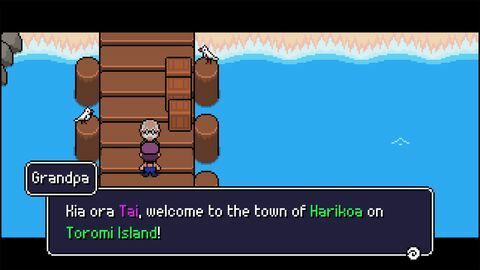 Visiting his grandparents on a summer holiday to Toromi Island, the game's main character Tai takes on the perilous task of cleansing the island of restless spirits that are threatening its inhabitants. Armed with formidable weapons including a cricket bat, a yo-yo, and a NERF gun, players take on everything from giant huhu grubs to skittering wetas. Not only has the game featured on the PlayStation EU Blog, it's had a limited run of physical editions, thanks to East Asia Soft. 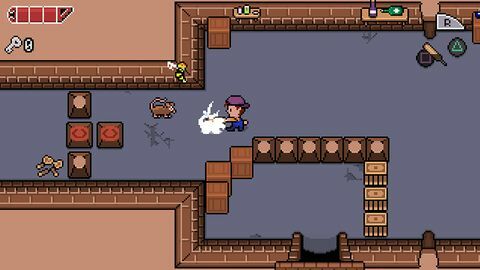 I sat down with Reverie's game director, Dan Airey and talked about the development process and the brief history behind Rainbite, a studio of three developers based in West Auckland. 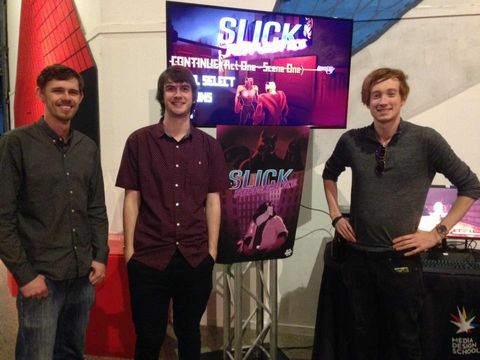 From Left to Right: Tom Butler, Jared Trail and Dan Airey showing off Slick while at Media Design School. "We weren't childhood friends or anything like that," said Airey as he described the founding of Rainbite Studios. Instead he, Tom Butler and Jared Trail met while studying at the Media Design School between 2014 and 2016. All three were enrolled in the Bachelor of Software Engineering discipline. "Jared and I met in the first year and became friends pretty much straight away," Airey added. "Tom joined us in the second year when we became better friends, and that's pretty much how things got started." Outside of studying, the trio worked on mobile games like rotoQube, applying this experience to their course projects. Their final year project was a twin-stick shooter called Slick: Ruff Justice. In 2016, as his final year of study was coming to a close, Airey began thinking about future projects. One of the most charming aspects of Reverie is how it feels so much like a summer holiday, set in a small coastal town in Aotearoa – an aspect that was inspired by Airey's own family holidays as a kid. "Going away with your family each summer was a fundamental part for each of us. So when I went to the guys, that was essentially my elevator pitch." Certain aspects like Ol' Martha, the possessed tumble dryer that acts as the game's first boss were pulled straight from Airey's holidays in Mangawhai. "There was a boiler underneath the house, and it was pretty spooky; all rusty and dirty. I always thought it was alive... and then one day when I was walking around the bottom of the house it switched on, making a huge noise. I got a huge fright, and ran off." It was definitely a trial by fire - especially for the first six months. Just a week after graduating from Media Design School, the trio reformed Rainbite in order to take on all the roles necessary to developing their game. The most immediate issue for the studio was its lack of a trained artist, with all previous work at university being handled by students from another discipline. "With student projects you work with artists," Airey noted. "The Programming students and the Art students came together for final year projects." With all three developers coming from the programming course, it was time for someone to dive into the deep end. "Initially we were all software engineers, and that's ultimately still the case. But to make a game you need to work in a couple of other areas... Of the three of us, I was just the best at art." Airey switched to full-time artist, while also acting as the point of contact with Sony. At the same time Butler handled any marketing needs while Trail stayed in his role as lead programmer. While there was a steep learning curve, the team quickly fell into a steady rhythm. Although, as Airey describes it, "It was definitely a trial by fire - especially for the first six months." Airey also wanted to work on the game's soundtrack as well, having studied music production previously. But the workload was building up, and so the studio looked for help, contracting the composition work to German composer Alexander Gleich. "We've had a lot of people say great things about the soundtrack," Airey noted. "It's the simple but catchy melodies of the 8-bit and 16-bit era, but also has a modern production that ties in nicely to Reverie." The team had worked full-time on Reverie, for the first five months, but they were starting to struggle financially. "I think I had about $30 to my name, so I needed to find a part-time job," described Airey, who ended up taking on web and app development contracts two days a week to keep a roof over his head. Similarly, Butler worked as a chef in a rest home for the duration of Reverie's development, working Sunday and Wednesday evenings "just trying to eke out a living." Fishing up islands is pretty common in New Zealand. #NoBigDeal. It's part of being a Kiwi, and if you're doing something so focused on New Zealand, it's really a fundamental part of the country. Another big part of Airey's initial pitch was to use the Legend of Māui mythology from Māori culture as inspiration for the game's lore. "I don't look it – cause I'm ginger – but I do have Māori ancestry," Airey laughed. "I wasn't brought up with any particular traditions or customs, but I still think it's really important. It's part of being a Kiwi, and if you're doing something so focused on New Zealand, it's really a fundamental part of the country." 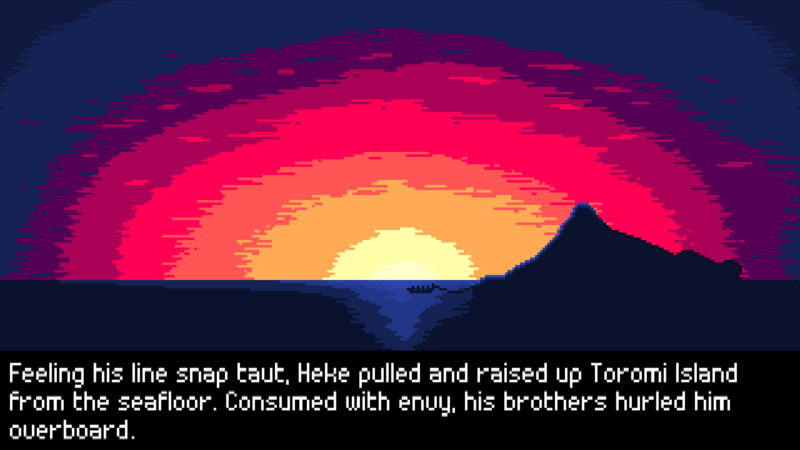 Similar to Airey, the game's main character is part Māori, and part of his holiday is about learning that heritage from his grandfather. For the studio though, the Legend of Māui was more of a starting point than something to be copied outright. "Ultimately it's a game that should be enjoyed by everyone, from kids to adults, and keeping it simple in that regards was the way to go," Airey noted. With this in mind, design and development were kept accessible for all. "We didn't want to go too crazy, so much of it was based on what a child would imagine." Livin' the NZ fantasy: at risk of tripping over kiwis left, right, and centre. Beyond the story, players can explore and collect feathers from NZ's native birds. Reverie's art design has obvious callbacks to the NES and SNES era of games, but unlike other retro aesthetic titles that have released in recent times, Rainbite's choice came more out of necessity. For a group of developers in their early 20s, this wasn't exactly a reference to their childhood either. "We definitely didn't grow up with the NES, and even the Super Nintendo was pretty early for the three of us," Airey admitted. For a first-time artist however, the pixel aesthetic was a god-send. "Part of it was just due to the practical realities of developing a game with three people, and working with an artist that has never done art for a game before." Focus was spent on making a living world, making sure characters and sprites were never static, and offered a level of interaction with the player. Backyard cricket has never been so deadly. Months into development and the studio was hitting its stride. The game was taking shape, and the team were beginning to gain interest with their community. An unexpected surprise came when they were contacted by East Asia Soft about additional publishing ventures. "We just got an email in our inbox, they were quite excited about the game," Airey remembers. "They offered not only digital publishing and translation services for Chinese, Japanese and Korean, but then they also offered the potential of this physical deal." The studio jumped at the chance. "Getting a game published physically is always the dream," said Airey. "It's real, it's there in front of you, and it's going to withstand the test of time." "We were quite floored and excited. I'm a collector of old games, so it's really quite a privilege when you know that there's collectors around the world that will have your game in their collection." Limited Edition copies were packed full of goodies for collectors. The Limited Edition copies on PlayStation 4 and Vita weren't just a token gesture either. Each copy came with a disc, colour manual (quite the treat these days), soundtrack, and a map of the game world. "We specifically asked for the map," Airey noted. "That's a big part of the adventure for me – I'd always love getting a game with a map. Even though it might spoil the game a little bit, it's always exciting to see. There's no point in doing a physical version if all you're going to get is the disc. People pay more for the physical copy, so you've got to reward people for that choice." 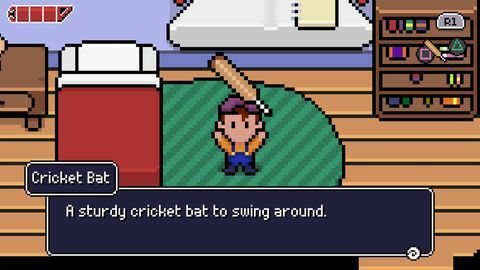 Not just an adventure game, Reverie is packed full of humour. Working within the PlayStation platform, the team reached out to key figureheads in the community, the most notable being Kinda Funny co-founder Greg Miller. "We got in contact with Greg after we'd heard him complaining about the trophies in the Friday the 13th game. We swapped a few emails and asked for his advice, and whether he would like to help design some trophies or check over our list and he was keen." "It also helped us get the word out, he certainly pointed the spotlight in our direction which was a big help." Miller wasn't the only one to help raise Reverie's profile within the PlayStation community. One of the lecturers at Media Design School put the developers in touch with key personnel at PlayStation EU, resulting in a spotlight article and trailer featured on the company's YouTube channel. "All of that helped, but I think it's the consistency of engagement and interaction from Tom that has really kept us from obscurity." Throughout development, Butler had been engaging fans on Twitter, Facebook, Reddit and other platforms. Not only was the interaction key in spreading word of mouth, but for a small studio with a minuscule marketing budget, it was essential. "Gone are the days of launching your game on Steam and selling 200,000 copies," explained Airey. "The biggest companies in the world are spending a quarter of their turnover on marketing, how do you compete?" The competition on Steam is... there's dozens of games that launch every day. Anticipation for the game was growing, but the Rainbite developers were set back when the Nintendo Switch was announced. For years, interest and support for the PlayStation Vita had been on the decline, with a dedicated few populating the self-titled Vita Island. One of its saving graces had been a string of indie titles, and with the exception of the Nintendo DS, there was little else on the market. "The Switch wasn't even announced when we started working on Reverie – at that stage it was still the Nintendo NX... so its reveal definitely took the wind out of the Vita sails a bit." Another hurdle came when other games started to publish on Steam under the same Reverie name. "We had built up the Reverie name, and then someone else launched a cheap game on Steam with the same title," Airey explained. 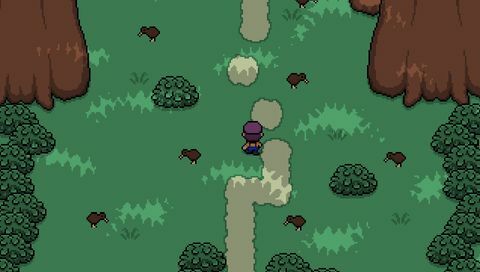 At the time of writing, there are now two Reverie games available on the service, neither developed by Rainbite. "The competition on Steam is... there's dozens of games that launch every day," Airey said with a resigned note. The chances of Rainbite's title gaining any traction now is notably diminished. "We'd need to overhaul a few things technically for different screen shapes and resolutions, as well as custom controls and all that. We'd rather be doing new stuff. There's a point where you've just got to stop porting your old games to every system under the sun and just work on something new." "It's probably an uphill battle, but never say never"
Launch day arrived, and the game released to a steady rate of sales. "It definitely wasn't a massive burst out of the gate," Airey stated. "I was under the impression that you live or die by the first two weeks of sales and after that hardly anyone buys it." But that wasn't the case, and sales of the physical editions have helped Rainbite enjoy a longer period of sales, injecting an upfront cash burst into the studio. To Airey's surprise, the game hasn't faded into obscurity either, enjoying a longer burn of sales, which has allowed Rainbite to continue promoting the game via social media; letting word of mouth spread. "Financially it's doing quite well. You can't expect a game that comes out first on Vita to make you a millionaire in this day and age." Reverie's reception has been strong as well. "Critically we're really happy," Airey said, proudly adding that "we haven't had a review under 7/10 – and that's a big thing for personal satisfaction." "Anyone can make a game, but to make a good game that people really enjoy – that really feels good." Anyone can make a game, but to make a good game that people really enjoy – that really feels good. Strong reviews from critics have had a noticeable impact on sales as well. "We had a really great review in German that I think got 5,000 views and that week in the European charts we saw German sales triple." "If it was a real flop, we'd have had to call it quits... but this has let us keep the lights on and pick up more projects. 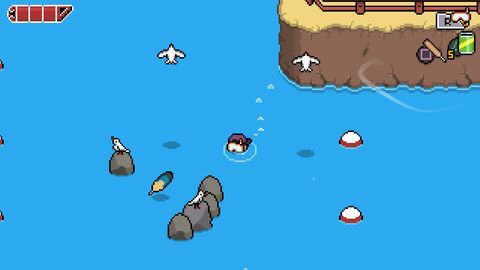 Now that Reverie is out of the gates, the trio are talking about porting it to Switch. In addition to that, the studio is working to publish Rym 9000. There's also hints at another game in the works, although Airey is pretty tight lipped about details – only sharing that it's "definitely on PS4 and "pretty likely" on Vita as well, with an option of a Switch version post-release." 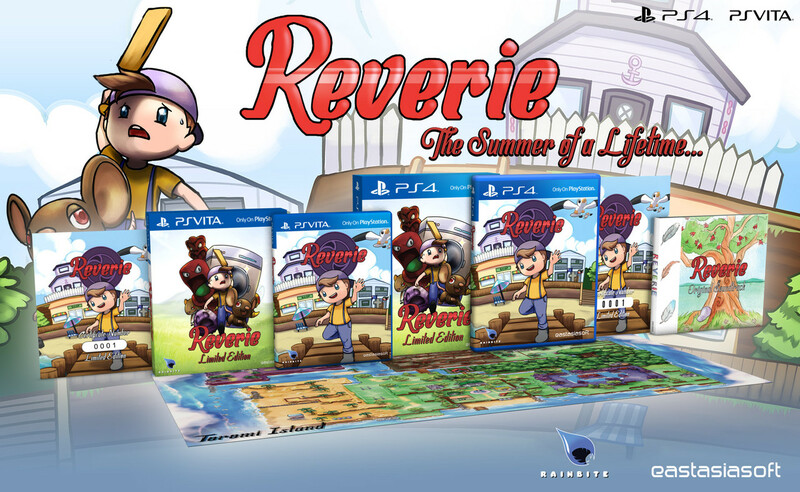 Reverie is available now on the PlayStation Store for PlayStation 4 and Vita.